Maria (Maria de Lourdes) Sturchler is a first-generation college graduate who received her M.D. after a circuitous path to her dream of becoming an emergency physician. She was a premedical enrollee in college, but earned her B.S. in Elementary Education after changing majors due to discouragement from a STEM professor during her freshman year. Although giving up the dream of medicine was difficult, education was another of her passions, and she began working in her former high school after graduation. Thereafter, Maria continued teaching at the middle- and high-school level for several years in public and private institutions. She concomitantly earned her M.S. in Mathematics Education and Ed.D. in Educational Leadership as part of her plan to keep opportunity’s door open to a future in an educational administration career. Her doctoral dissertation focused on the gender gap in STEM fields, however, and re-ignited her desire to pursue a medical career. In 2010, Maria restarted her medical school prerequisite coursework and simultaneously completed her doctoral thesis with the unflagging encouragement of her colleagues, mentors, and family. 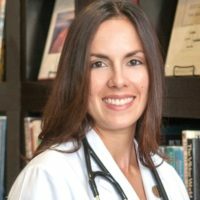 In 2013, she gained acceptance to Vanderbilt School of Medicine, graduating in 2017, and she is currently completing her Emergency Medicine residency in San Diego at Kaiser Permanente. When she is not in the ER, you can find her cycling, trail running, enjoying San Diego's cuisine, or working on her advocacy efforts. She lives with her husband and is currently searching for a rescue dog to join their family.